Gown sized Preemie, Newborn, Infant & Large. Bonnet sized Newborn & 2 months. 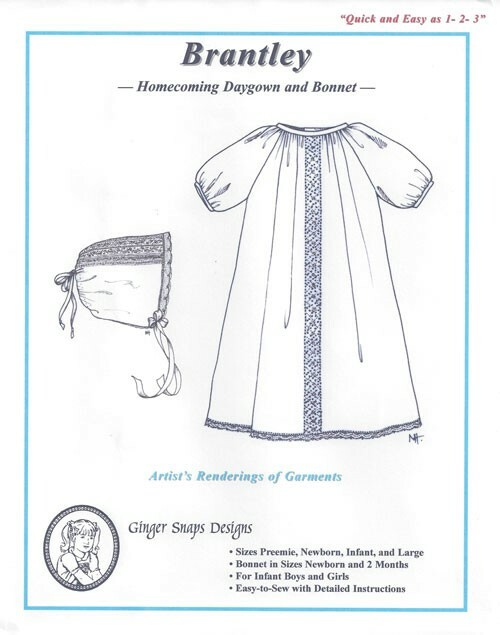 Easy to sew pattern that is perfect for a home from the hospital gown for baby boy or girl. bishop disgn allows a margin for size variations which is good when considering birth weights & birth dates. Features a 3/4 length sleeve and a long puff sleeve. Easy back placket or back button closing. Lots of possibilities for embellishment!